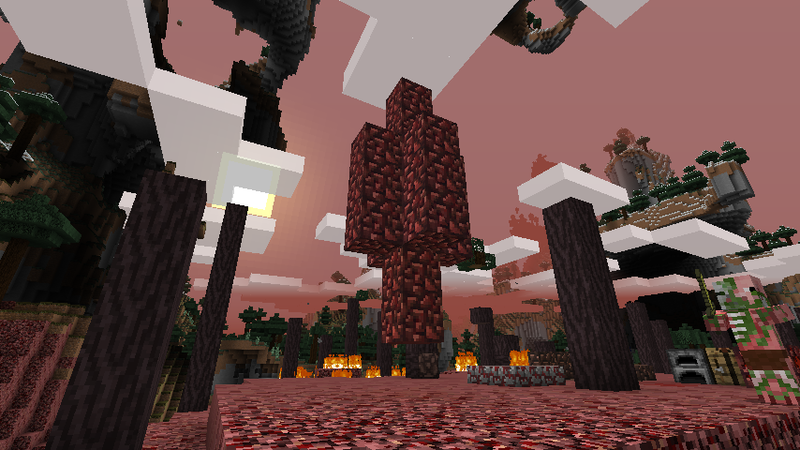 The Creeping Nether is a mod which causes the Nether to spill into the overworld. 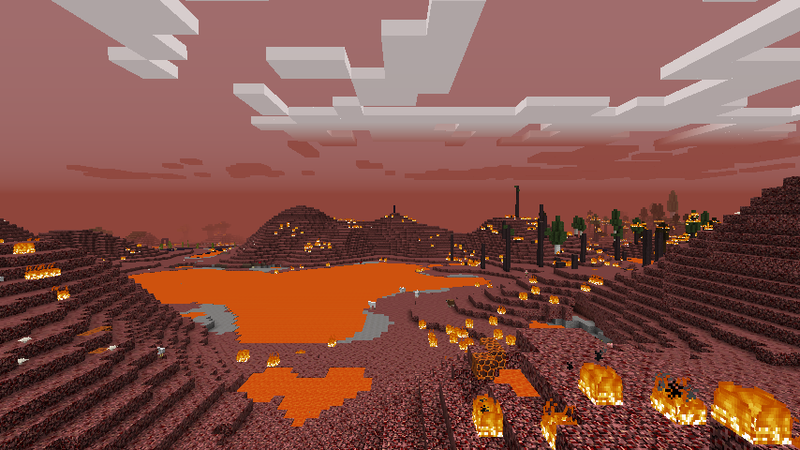 When you build a nether portal, it will begin to slowly corrupt the land until all that is left is a scorched hellscape. There is a limit to how far the corruption can spread however, and the corruption can be halted by breaking the portal. More configuration options to control what blocks will corrupt into. Default configuration supports Biomes O' Plenty. Nether essence can be obtained by mining nether ores in the overworld. Nether essence can be used to corrupt blocks much like a portal. This essence can be purified by washing it with a ghast tear. Once purified, it can be used to purify nether blocks into "Hallow" blocks. Netherlight roses will sometimes grow upon hallow grass. They are a flower that emits light. Zombie pigmen can be purified into living pigmen. Also the sky is red now. Stone and dirt will turn to Netherrack. Sand will turn to Soul Sand and grow Nether Wart. 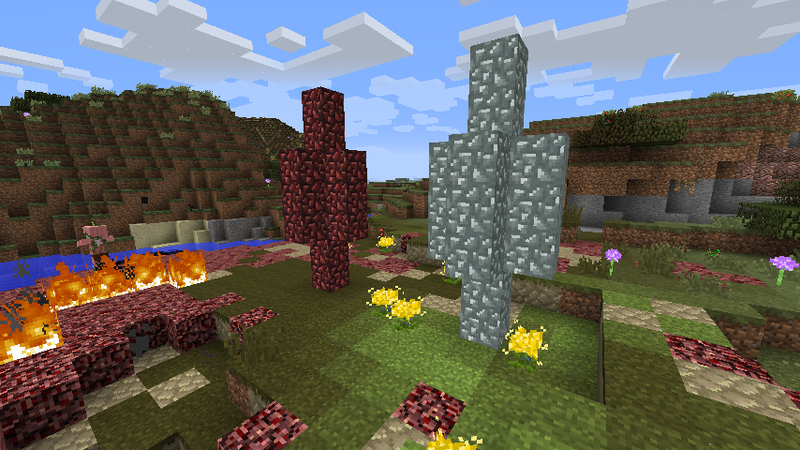 Cobblestone will be corrupted into a new block called Blood Stone. Trees will burn into charred wood, which drops charcoal. 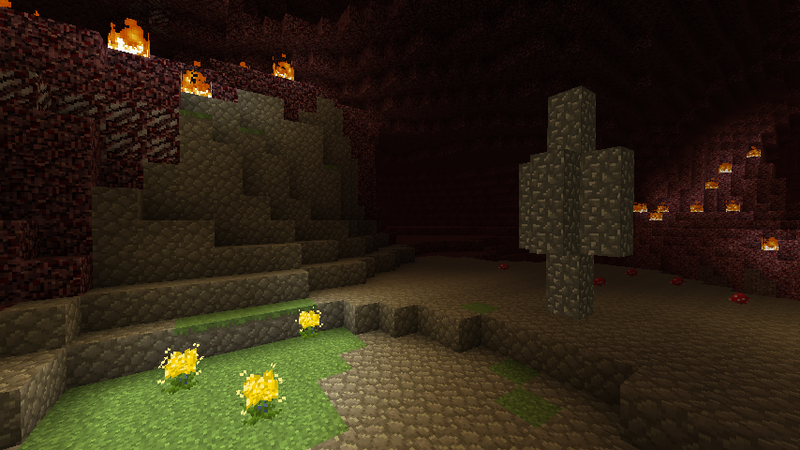 Mobs from the Nether will also spawn naturally in the Creeping Nether. The Creeping Nether will occasionally let loose a strike of lightning, transforming any mobs that are affected. Villagers turn into witches, pigs turn into zombie pig men, and slimes turn into magma cubes. Unable to handle this unstable energy, cows will explode and sheep will burst into flame. Corruption will also occur in the Nether itself, but this can be turned off if you need. Ores corrupted by the Creeping Nether will have slightly higher yields. How do you create the obelisks? I can't figure them out. How the hell do you build this Catalyst obelisk? I've tried every combination I can think of and they don't do anything. You can't see anything about how it's supposed to look internally from the pictures. Also is there some sort of activation to it or is it just build and it goes? Is it possible to add a way to stop the spread outside of breaking the portal, like it couldn't get through a wall of bedrock, cuz I made a little bedrock display, way off the ground, and it still spread like the air and bedrock were normal blocks. Also a nice addition would be things to control it such as a RF powered nether repeller or even one that runs on nether essence/blocks/etc. Would be super useful for having to survive the nether spread, or like "get to space (with galacticraft) before the nether consumes you!!". More great ideas: Nether essence and other items of the sort to RF machine. Existing in the tainted nether overworld causes you heat damage (maybe even nether too) without special clothing or whatever (Tough As Nails integration might help). Another complicated thing, keep X (configurable) chunks loaded around the portal so it spreads infinitely even when you're not around it. (so the loaded chunks would spiral outwards around the nether portal(S) with a max of X (let's say 9) loaded, and they change randomly or just spiral, however, so that the nether spreads evenly (relatively) (maybe speed up spread rate as it goes out to keep a somewhat relative overall spread speed. If you don't, it goes slower the further it goes out because each chunk is loaded less often, cuz more chunks to load.). Then like for a map you can toggle this on and you have ya know like 10 minecraft days to GTFO of your starting house or you will be consumed, and you don't have to have a chunk loader(s) active for it to spread to you from way off the map. Big takeaway here, Limits to stopping nether, and maybe RF integration. Could you add all of the vanilla blocks to the corruption config rather than having it hard coded? It would be a massive help to customizing the mod a bit! Also, could a proper tutorial for the Catalysts be given in the mod's description, because they just seem random and worthless currently. I was planning on doing this, but some of the block names are changing in weird ways in 1.13 (for example, minecraft:grass becomes minecraft:grass_block and minecraft:tallgrass becomes minecraft:grass) so I think I'm going to wait until then before I move vanilla blocks to config. Still, you can override what the blocks turn into in the config if you need to. The values in the config file will take priority, and you can set them to transform into null (minecraft:grass>null) to prevent them from transforming at all. Healthy pigmens is the best idea of the year!! Is this allowed in modpacks? It'd be good for a Halloween pack I'm thinking of making. I don't see why not, go ahead. I suppose I'm replying a bit late though. 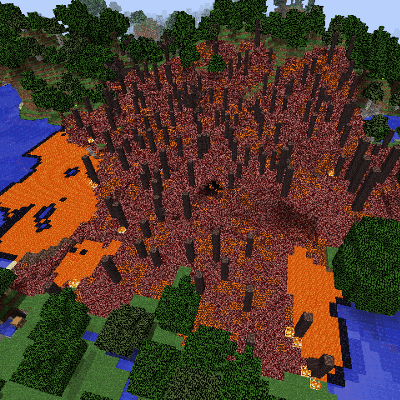 This would be devastating with Natural Nether Portals. I'm gonna go be stupid and install those mods together. Have you considered a end version so not killing the dragon is a threat? Even a 'power needed' block would be fine, that they have to 'feed' power to to 'control it' would be great! Any chance of backporting this to 1.7.10? I'd love to use this in a apocalypse modpack for me and my buddies to play on. I'd be interested so we have some dynamic event happen for this, and to put greater emphasis on guarding your portals, instead of opening portals to hell willy-nilly.